What do you get when you combine the fun of nachos with the yumminess of dessert? These 15-Minute Fruit Nachos—a sweet treat that's ready in just 10 minutes. PREPARE 1 pkg (4-serving size) Jell-O Instant Pudding, any flavour, as directed on package. PLACE Honey Maid Graham Wafers on individual plates; spoon pudding over wafers. 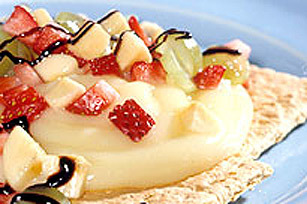 Top with sliced or chopped fruit such as strawberries, bananas and grapes. DRIZZLE with chocolate sauce or syrup. Create your own flavour combination of pudding and fruit. Have all the components ready and let everyone create their own nachos.